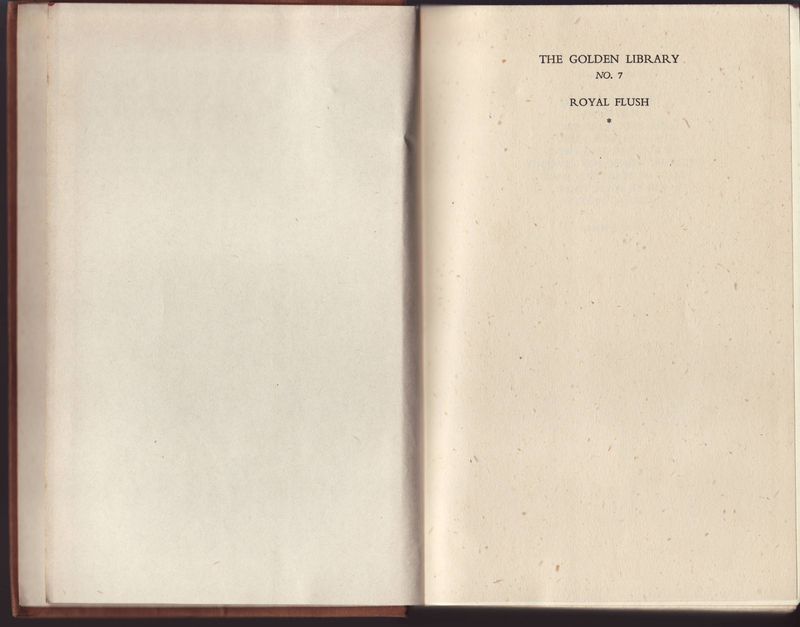 Chatto & Windus revived the name of their 19th-century series the Golden Library in 1936, setting it off on a brief run (through 1943) of titles numbered up to #29. 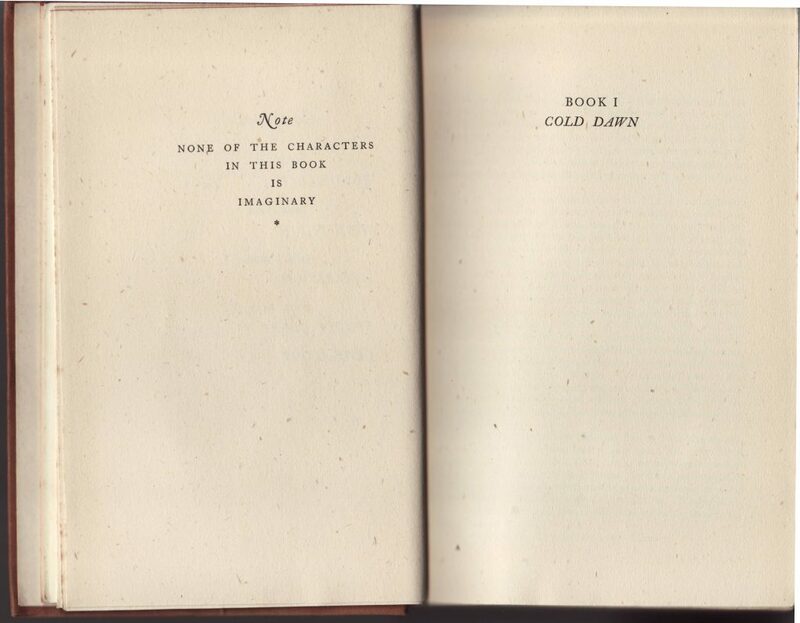 Unlike the earlier series, which consisted of a mix of mostly literary classics of the era, the later Golden Library consisted of back catalog titles from the publisher. 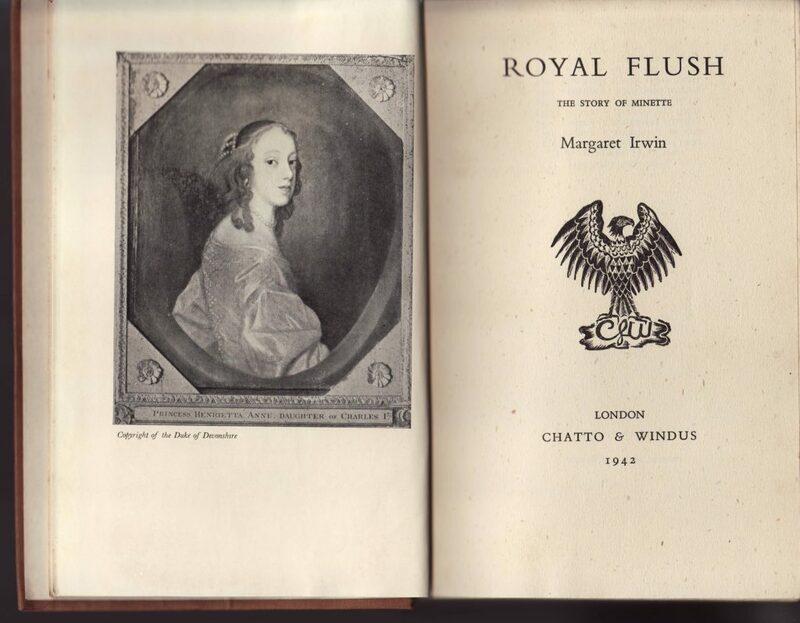 Early jackets (1936-1941) were common to the series and featured the Chatto & Windus colophon (left). Titles published in the last few years of the series had unique jackets, possibly reused from the initial printings of the titles. 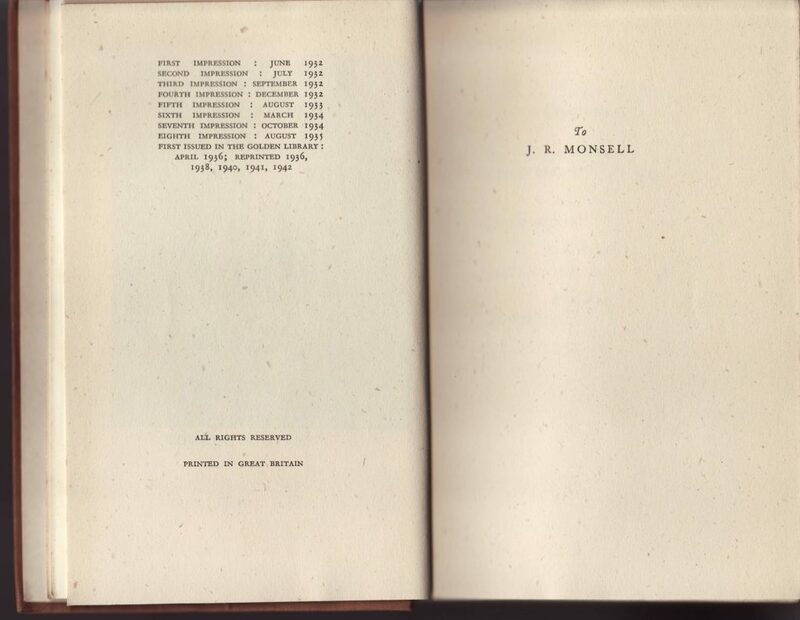 A list of titles in the later series, sorted by year and with serial number, are below. 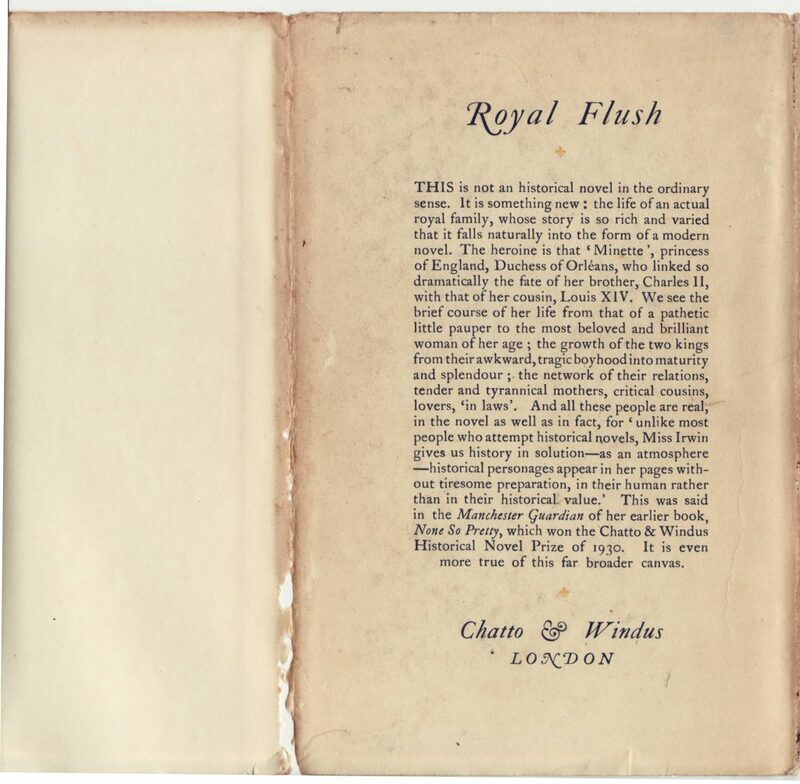 I can’t track down the titles associated with six serial numbers, but there are two titles (Strachey, Forbes) which seem to be in the series, but their series numbers are unknown. 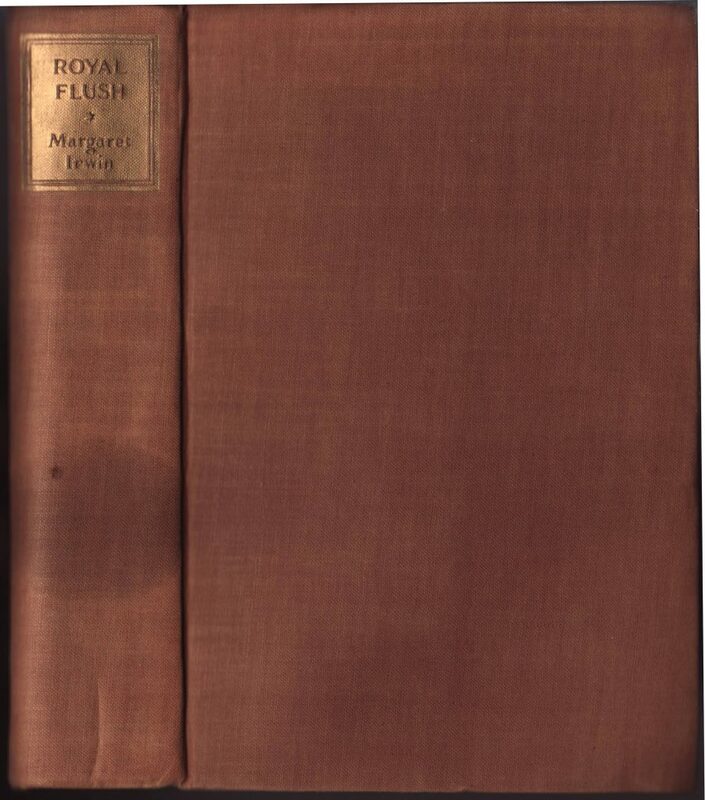 The jacket for Margaret Irwin’s Royal Flush is from a fifth printing (in the series) of the title in 1942. At least three Irwin titles were reprinted in 1942, all with this style of jacket. They seem to be the last titles published in the series. 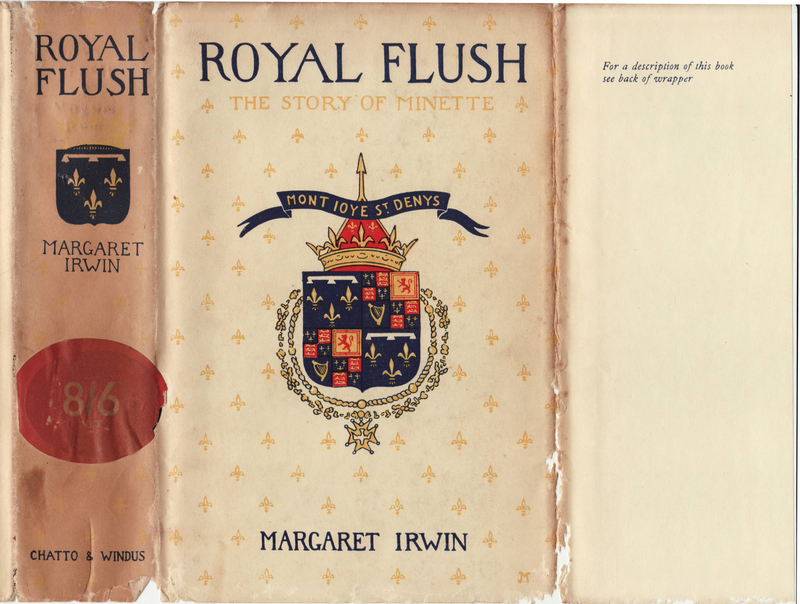 The jackets may have been specific these three of Irwin’s historic romances issued in 1942. With these later jackets, the series name is absent. 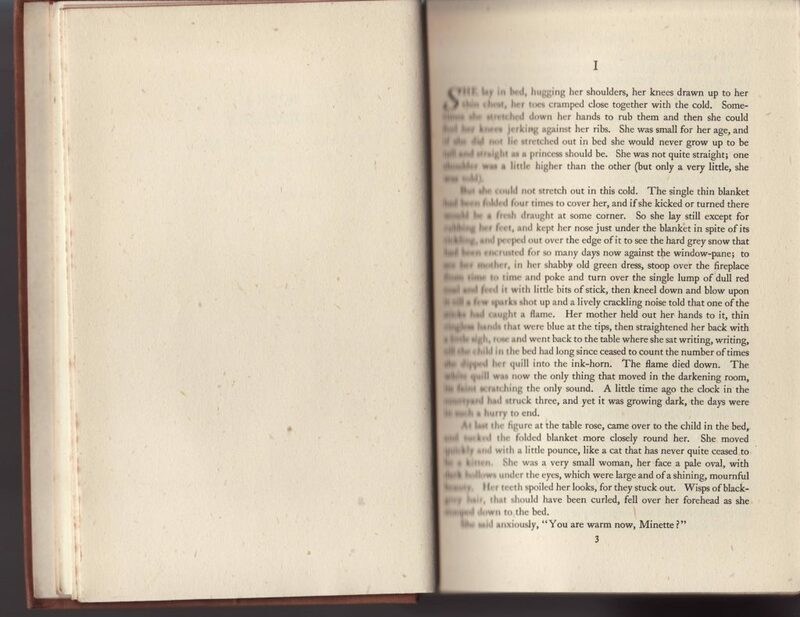 A sticker on the jacket spine with an 8/6 price seems to be covering text indicating “Cheap Edition.” The front jacket flap is blank except for direction to the rear of the jacket for a description of the book. 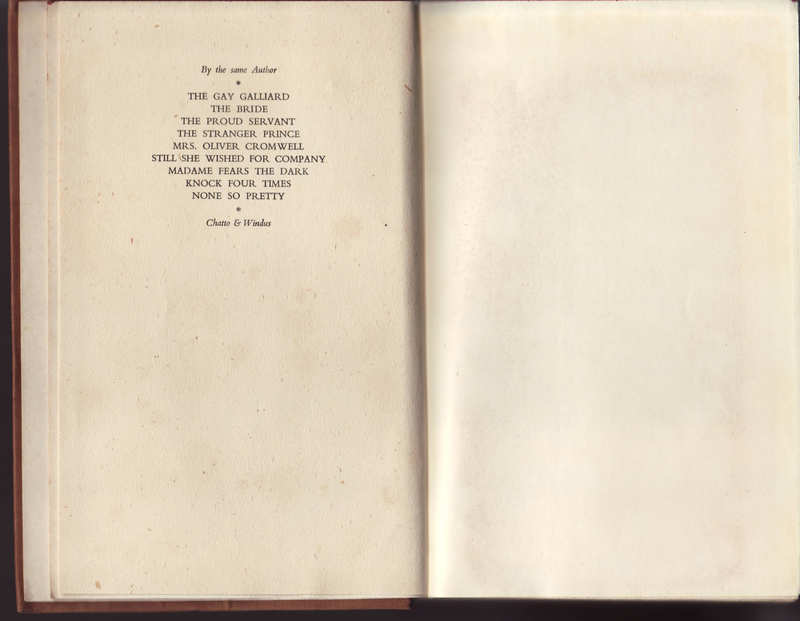 The rear of the jacket describes the book, and the rear flap is blank. Brown cloth bindings with the title and author in a gold printed box on the book spine. The title page is faced with a frontispiece illustration. 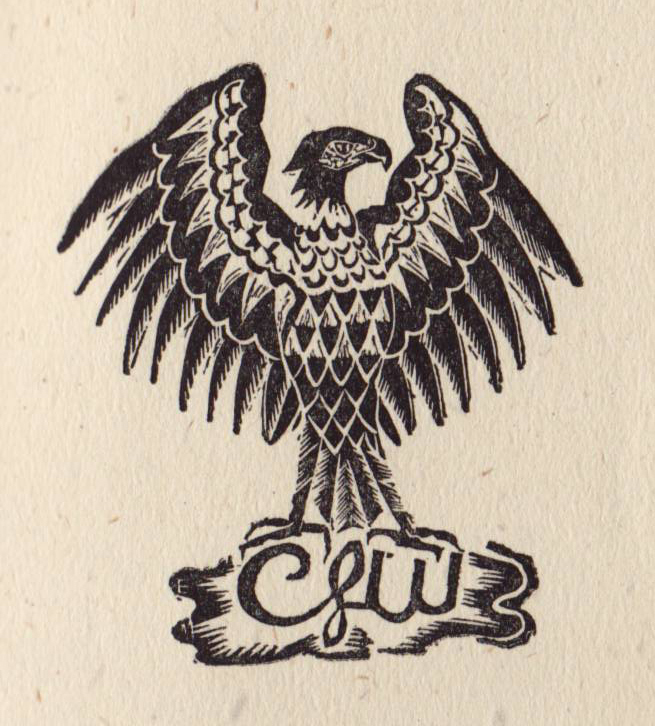 The title page includes a Chatto & Windus colophon (which was featured on the front of earlier jackets) as well as the date of printing (1942). 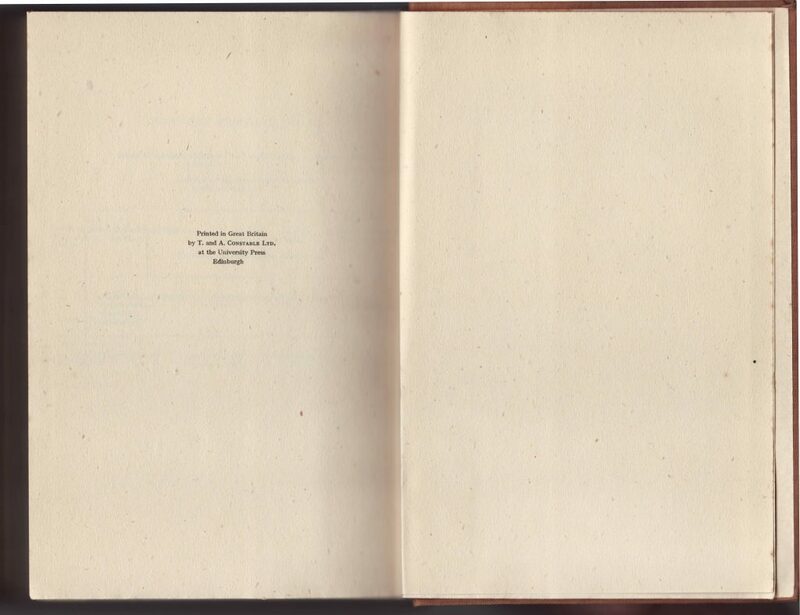 The printing history of the book is included on the copyright page. 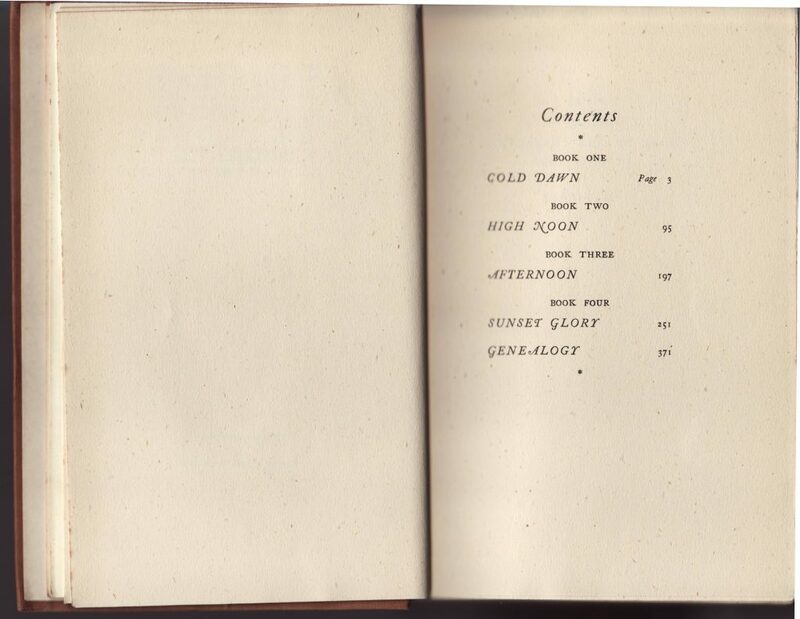 The book was printed by T. & A. Constable Ltd., at the University Press Edinburgh.